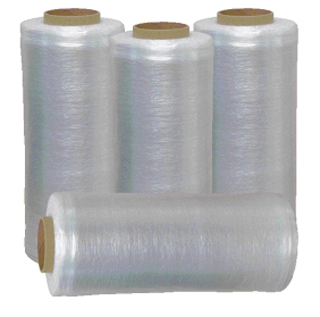 Pre-stretch wrap is a clear residue-free film that is pre-stretched at the factory and wound on rolls. The pre-stretching causes the film footage to lengthen thus lowering your packaging cost because of possibly unstretched waste. Because users might not fully utilitize all the elasticity strength of traditional stretch film, we offer a wide selection of pre-stretched film. Pre-Stretch Hand Stretch Wraps and Bundling Films are pre-stretched out to about 90% at the factory. This is why the guage of pre-stretched film is thinner than traditional strech film due to it being pre-stretched at the factory. This leaves some elastisity still available for the user to bundle the packaging without as much muscle fatigue as traditional stretch wrap and without as much waste. The strenghth of the film is not compromised and the cost savings remain consistant for your business!